The Karnali River is one of the longest and largest rivers in the far west of Nepal. It originates in Tibet's Mt. Kailash and descends gently into the Himalayan landscape of western Nepal. The area through which it flows is full of wilderness with deep forests abundant with flora and fauna and is relatively unpopulated. After the monsoon rains, the rapids become huge and more technical. One highlight of this classic river journey is a 7-km-long gorge “thrill-a-minute roller-coaster ride” with rapids at every bend. Truly though, any season suits the Karnali. The expedition begins with a bus journey into the remote and almost untouched region of western Nepal and crossing through part of the Bardia National Park. If the idea of a two-day bus ride doesn't appeal to you, there is the option of flying to Nepalgunj and catching a five-hour bus to meet the rest of the group in the frontier town of Surkhet. From here, we drive further, for about four hours, to get to KalyaniDanda, the last stop. The river section lasts seven days, including one layover day. 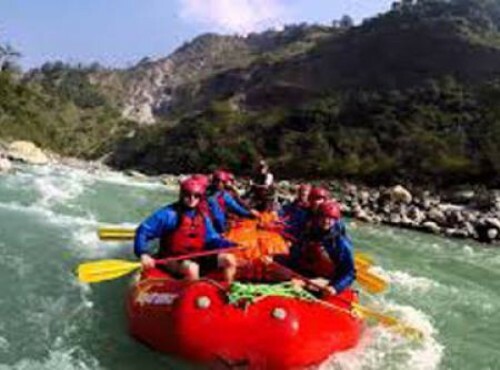 By combining this trip with a short trek or a trip to Bardia National Park, Karnali rafting is an ideal choice for those who want to have a truly unique experience in Nepal. Day 02: 05:00 PM. Arrival at Surkhet. Trek option: begin trekking straight away. Camp at a school halfway to the river. Day 03: Continue Trek to river arriving early afternoon, rafting for an hour or two, and Camp. Day 06: The big day - God's house rapid and others.